OLD PARKED CARS. : 1977 Toyota Corolla Deluxe Liftback. 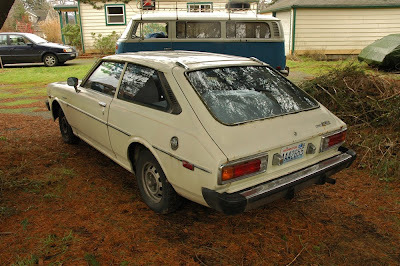 1977 Toyota Corolla Deluxe Liftback. 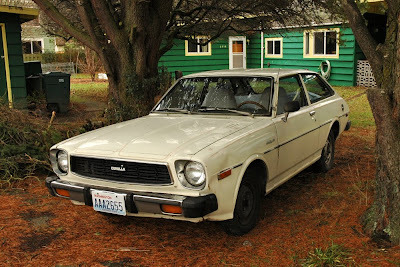 It's hard to tell, but these 2 cars are parked at the same kooky house up in Bellingham. Shooting 2 cars in one yard is so much more stressful! Perfect. Just get rid of that donut spare tire. I love this car. I have wanted one ever since someone I knew had a bright yellow one when I was a kid. Holy crap, that TE51 is exactly the same color and everything as the one I'm parting out. I wonder if they need parts, like a matching rim for the front? lol! I need a set of doors for my 77 Liftback.